The lychee and coconut flavors in these cupcakes are subtle, but decidedly tropical. The cake texture is crumbly and moist. 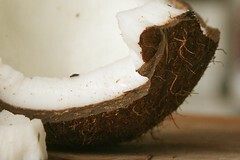 The chopped lychee and coconut provide interesting texture variation. The unfrosted cupcakes are delicious and not too sweet, perfectly yummy on their own. The frosting was fantastic as expected, when is cream cheese frosting not? I added about a tablespoon of fresh ginger which provided some texture, but added more and more ginger powder until I was happy with the bite. I can’t say exactly how much I added, but its best to just add to taste. The burnt caramel sugar decorations added a nice crunch and another layer of flavor. Overall, these cupcakes tasted pretty special… very multi-dimensional and flavorful. The recipe should be a good starting point for any combination of tropical flavors. There was to be only one option, fresh coconut. Fresh is always superior to dried, no? 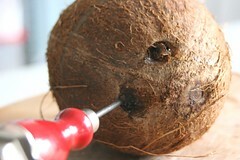 First I took an ice chipper and a hammer and poked a couple of holes into the coconut. 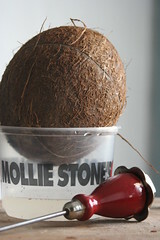 I set the coconut over a plastic container to drain. Then I took the coconut, wrapped it in a towel, grabbed a hammer, and relocated to the front stoop. There I preceded to bang on the coconut until the darn thing gave. That took some brute force. It had been a while since I cracked a mature coconut and it proved to be mildly frustrating. The cracked coconut and I returned to the kitchen where the flesh was separated from the shell with a butter knife. The brown skin was peeled off the flesh with a vegetable peeler. The flesh was rinsed in cold water and 4 ounces was weighed into a tared bowl. I opted for using a food processor to grate the coconut flesh. Given the amount of time I had already invested in the coconut, hand grating with a box grater seemed extravagant. I grated in small batches in the hopes of getting at uniformity. It worked out fine. I am not sure just how much better the fresh coconut is compared to bagged, as I didn’t try the second option. I can only hope it was worth the effort. Printable, PDF-version of the recipe. This is so beautiful….who could eat such a work of art? Congratulations! i am so amazed at your cupcakes! They are absolutely beautiful! Do you sell them anywhere? 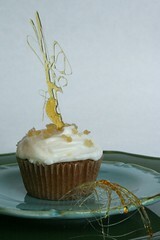 i am starting to experiment with cupcakes and really want to make a wide variety! Thank you – you are certainly an inspiration! oh my goodness. i happen to have some fresh lychees on the kitchen counter right now. this is the dreamiest combo of flavors i need to make this! thank you for posting this recipie! i do have one stupid question. what is coconut cream powder? is it something i can find in the baking section or more like at a asian market? Wow…the sugar decor is awesome! Great way to top such spectacular cupcakes. hey, jenne. i got the powdered coconut cream at an asian market. you can use the powder or the can of coconut cream. if you only have a can of coconut milk, that should be fine, but take the top thick layer of the can. chin run, i barely sell them. i am usually too busy with my actual job and i find i prefer to make them for myself. baking for money is stressful. another question – what do you use to top the icing? do you use one of those piping bags with the cones? i have used a pallette knife to smear the icing on, but it just looks messy! if interested, you can see the pic on http://www.sweetoven.blogspot.com! Your pink cupcakes are cute! I use a piping bag with a large #3 star tip. Next time I do some frosting with a piping bag, I will have someone take pictures and post a ‘how-to’. Often I will just smear the frosting on with a pallette knife. The key is to scoop the frosting with a big spoon and transfer it to the cupcake so its kind of even (or a small ice cream scoop). If you dip the scoop in hot water first (then dry it) the frosting will slide out easy. From there you smush it down with the pallette knife and even it out. You can also dip the pallette knife in hot water, wipe dry, then smooth down the frosting. Argh, I meant #6 star. Fantastic recipes – I’m really blown away. Another good way to get coconut out of it’s shell is after draining place it in a 350 degree oven for about 20 – 25 minutes or so. The shell will crack and pop open and then you can remove the flesh with a rubber spatula and peel off the brown stuff with a veggie peeler like you mentioned. I know my question is coming nearly a year after you posted the recipe, but do I mix the coconut cream in with the eggs and oil before adding to the dry ingredients? Hello there. 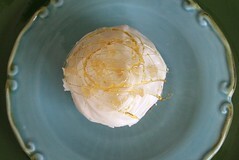 I came across your blog just today as I was searching for some recipes for a lychee filling. 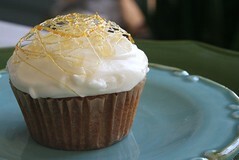 Have you ever tried a lychee filling for your cupcakes?? I’m a pastry chef just out of school and a special request has been made and I don’t have much experience with lychees. i am wondering when you say “glucose” in the sugar decorations, exactly what you are referring to? where are the copyright details for the pictures on this website? not sure what you mean by that, but the site and its photos are registered with the copyright office on a regular basis and are protected by an all rights reserved copyright. I just made these at a potluck party yesterday evening and they were a total hit. Everybody loved these! I’d never worked with a fresh coconut before so this was a fun excuse to get out the hammer :D And the lychees were very subtle, a nice touch. I love how the cupcakes themselves are lactose-free so you can omit the frosting for anyone who’s lactose intolerant (very handy!) Though I have to say the frosting was very popular, people loved it as much as the cupcakes. Thank you for this recipe! I love all the uncommon flavors you use! This sounds delicious. I can’t wait to try out this amazing looking cuppie! Love Lychees!!! Totally my favorite fruit on the planet! Thanks so much for the recipe!